Thy gift, thy tables, are within my brain Full charactered with lasting memory, Which shall above that idle rank remain Beyond all date, ev'n to eternity; Or at the least, so long as brain and heart Have faculty by nature to subsist; Till each to razed oblivion yield his part Of thee, thy record never can be missed. That poor retention could not so much hold, Nor need I tallies thy dear love to score; Therefore to give them from me was I bold, To trust those tables that receive thee more; To keep an adjunct to remember thee Were to import forgetfulness in me. Of you, your memory can never be forgotten. Would imply I could forget you. Kim, Suzy. "Shakespeare's Sonnets Translation." LitCharts. LitCharts LLC, 11 May 2014. Web. 23 Apr 2019. Kim, Suzy. "Shakespeare's Sonnets Translation." LitCharts LLC, May 11, 2014. 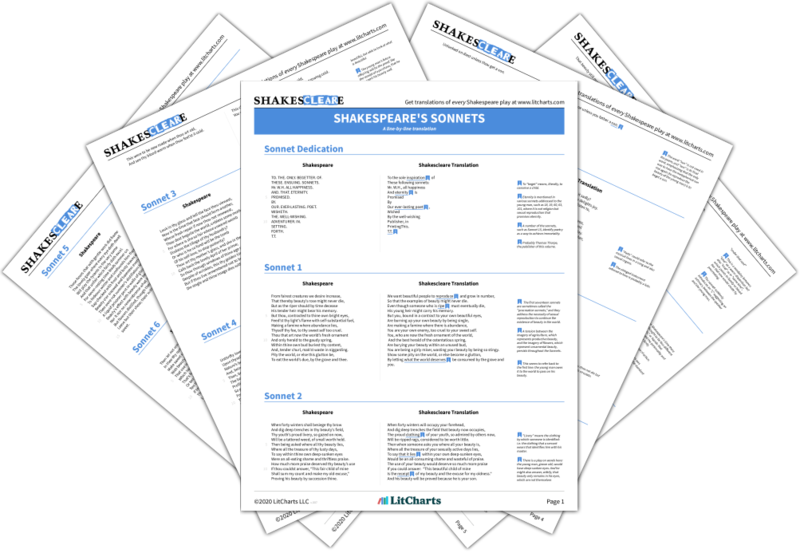 Retrieved April 23, 2019. https://www.litcharts.com/shakescleare/shakespeare-translations/sonnets.